Part One of this series dealt with the genus Pinus, including its history and botanical characteristics. Beloved around the world for toughness and adaptability, pine trees are uniquely important in Japan. Known as matsu, they’re iconic cultural symbols, associated with endurance and eternity -- and appear prominently in Japanese gardens, literature and art. This article, Part Two of a series, examines Japan’s two most important native species, both two-needle forms. They are also large trees that reach 60 feet or more in the wild when growing under favorable conditions. However, they take well to pruning and shaping, and can be kept much smaller, thus remaining in proportion to other garden elements. These two species are Pinus thunbergii (kuro matsu, translated as “Japanese black pine”, and a seacoast native) and Pinus densiflora (aka matsu, translated as “Japanese red pine”, and native to low mountains & hillsides). In gardens, they’re traditionally used to represent these native habitats. Among the three categories [2,3 & 5-needle pines], 2-needle pines are usually the best choice for your Japanese Garden. There are numerous reasons for this with the most significant being the irregular growth pattern displayed by most 2-needle pines. If you see a pine tree naturally growing in a winding, twisting shape, it is likely a 2-needle, or perhaps a 3-needle pine. 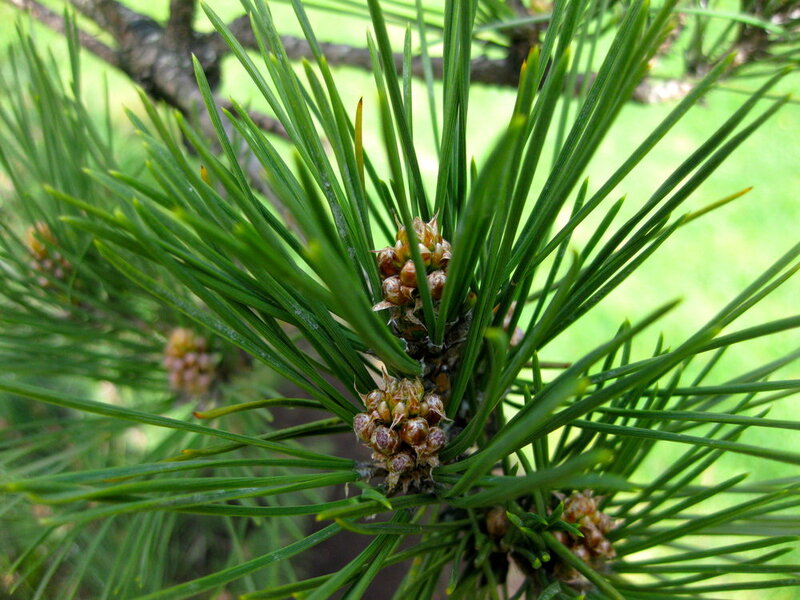 In general 5-needle pines grow tall and straight, and have fewer Japanese Garden applications. 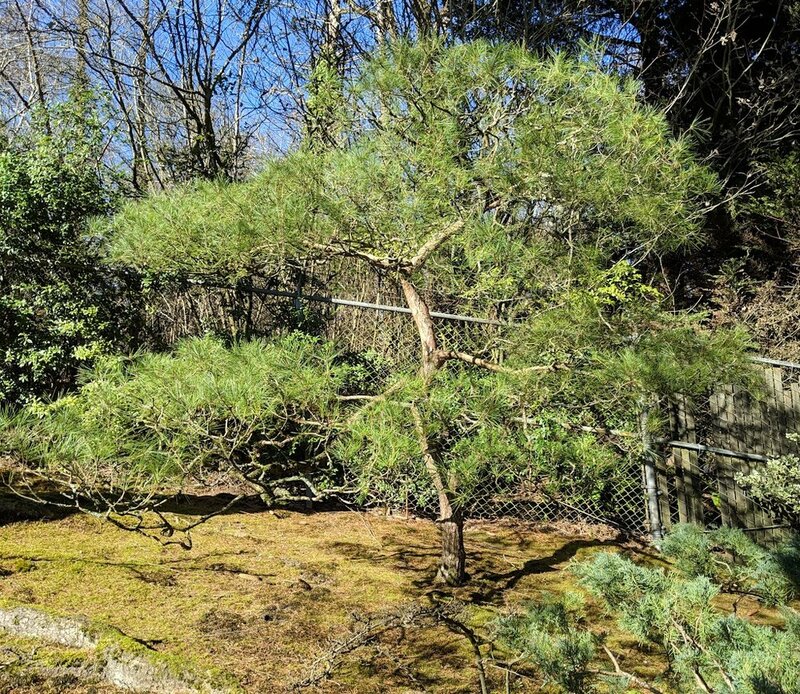 With regular pruning by skilled artisans, these 2-needle pines develop the powerful forms & character so appropriate to the aesthetic of Japanese gardens. Pinus thunbergii is native to Japan and Southern Korea. Hardy to USDA Zone 5 (minimum temperature -20 to -10 degrees F.), it’s the dominant species from sea level to about 3300 feet. It grows best in full sun and moist, fertile, well-drained soil, but is tolerant of poor sandy soils, drought, summer heat, and cold, salty winds. The densely crowded dark green needles are 2 ½ – 4 ½ inches long, stiff, sharply pointed, outward-spreading and often slightly twisted. Their upright buds (candles) are silvery white and pointed. Immature seed cones emerge magenta-colored, alone or in clusters. In their second autumn, they mature oval-shaped, brownish, and 1 ½ - 2 ½ inches long. Old trees develop blackish-gray bark, deeply fissured into irregular plates – hence the common name black pine. Historically, Pinus thunbergii was widely planted throughout Japan. Only Cryptomeria japonica, known as Japanese cedar, was cultivated more extensively. Black pine was highly valued for its strong, rugged form, and was planted as a street tree and in temple gardens, serving as a boundary marker at Shinto shrines. It was used for hedges and planted along the coast to stabilize shorelines & serve as a windbreak. Its wood was used in construction, especially framing, and as a fuel. Other products included turpentine & varnish. Pinus densiflora is native to rocky slopes in China, Japan, Korea and nearby areas of Russia – and has been cultivated for millennia in Japan. Although hardy to USDA Zone 4 (minimum temperature -30 to -20 degrees F.), it’s intolerant of hot, dry or cold winds. Needles are 3-5 inches long, soft and bright green, appearing finer and more delicate than those of black pine. They look tufted and are held somewhat upright along the stems. Seed cones mature in autumn of their second year, and are oval to oblong-shaped, tawny yellow-brown and about 2 inches long. They occur singly or in clusters. The common name, red pine, derives from the distinctive orangish to orangish-red color of young bark, which peels off in thin scales. With age, the bark lowest on the trunk becomes grayish and divided into oblong plates. Compared to P. thunbergii, it is slower-growing and more likely to have multiple stems at its base. Pinus densiflora was historically important as timber, used to construct buildings and bridges. With a high resin content, its wood is strong and highly rot-resistant. Beams of red pine are still to be seen in ancient temples, and it’s preferred over hardwoods even today as a hot-burning fuel for pottery kilns. It was also used to make musical instruments, implements, turpentine & varnish. Highly valued as an ornamental tree, red pine was planted in both private and temple gardens. Japanese black pine is also referred to as on-matsu (the male pine), and Japanese red pine as men-matsu (the female pine). As mentioned, their needle qualities, bark colors and branching habits are significantly different. Historically, these differences were believed to express the “masculine” or “feminine” nature of each species. In gardens, both species are pruned biannually to express their essential natures and reveal the effects of their environments. Black pines especially are shaped to represent the dwarf, contorted forms created by battering seacoast winds. Unfortunately, needle blight has affected many pines in the garden, especially shore pine, and environmentally safe treatments have been mostly unsuccessful. Japanese black pine, which has shown the best resistance, has been planted to replace some of those that are failing. Each year, the pruning of the pines honors and reveals anew their magic: their strength of form, their endurance, and their suggestion of eternity. From “The Garden Refined: Perfecting the Vision through Expert Pruning” (Seattle Japanese Garden blog, November 2016). For additional information, see also previous articles by Pete Putnicki and Andrea Gillespie.